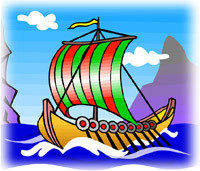 1 Imagine you are on a Viking ship. The large square sail is full as the wind pushes the ship through the water. The narrow prow cuts through the waves, while the light hull makes the ship ride lightly on the water's surface. 2 There is one main deck level. But the deck is removed in the center of the ship for the animals that are carried. Tents are rigged on the bow or stern for shelter. Perhaps you would like to lie out under the stars to sleep. 3 Your ship's captain is Leif Eriksson. He listened to the stories of another man who claimed he had seen a new shore. Leif wanted to find it. 4 The first land you come to is probably Baffin Island. It is a wild, beautiful place, but no good for a colony. It would be hard to build a shelter or fire without plenty of fuel, and trees are scarce. Leif calls it Helluland because of the flat stones. 5 The second place the ship stops is along the coast of Labrador. Here there are trees in plenty and a long, white, sandy beach. Leif calls this place Markland because of the forests. This place has potential. There is only one thing missing: grass for the cattle to eat. 6 You set sail once more, going further south. After a time you come to another place. It has large grassy spaces for cattle and plenty of trees. There are plenty of fish for catching and wild animals to hunt. 7 Leif decides that this is the place to build a village. Trees are felled and the building started. Leif calls this new land Vinland the Good. 8 Seven buildings take shape. One is a Viking great hall, some are long houses, and two are for the blacksmith and carpenter. You stay for a year. The winter was mild with no snow. The next summer you go home again. Leif wants to tell others about Vinland and invite more colonists to come. 9 The stories of Leif Eriksson's arrival in Canada were once thought to be just stories. Then proof was found. At L'Anse aux Meadows on the northern tip of Newfoundland, the ruins of a Viking village were found.